This little basket is a perfect container for a Valentine's gift of Hershey Kisses. I made these baskets as table favors for a Valentine's dinner. I adjusted the pattern after row 7 (36 sts.) by continuing to work in the round, but without increasing, for 5 addtional rows. I then slipstitched twice around the top edge before adding the handle. These are so adorable! The flowers are stunning! An Easter version would be fun, too. These are so sweet and make my heart smile! Thanks for sharing your sweet talents here! HPS! Have a wonderful week! I crochet, but I have never tried anything like these cute baskets. So cute and you did a beautiful job with them. Hello, those baskets are adorable. Did it take long to do them? I am your newest follower (GFC), and found you via 'Creative Mondays'. I hope you have a great day! These are so sweet and cute and just in time for Valentine's Day. I love how you gave them as party favors, too cute. Thanks so much for linking up to Making Your Home Sing Monday! okay those are sooo cute! Hopping over from creative Monday Hugs! I love those baskets--esp. the flowers! Love these cute baskets! Just the perfect size for a handful of kisses! These baskets are adorable!! Cute and clever! These are very, very cute! Love them. Really cuties. Perfect for VD giveaways. So cool. Happy TTT & TY for sharing. Very cute! I must try! These are so adorable!! You did a fantastic job! Thank you so much for sharing at A Bouquet of Talent! Have a wonderful weekend. 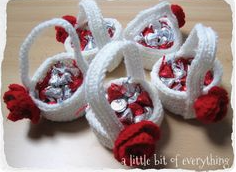 What a cute way to hold your Valentine goodies for those you love! I love this! I'm hosting a Loving Valentine's Day party and I'd love for you to stop by! Cute! I will have to try one. 2 cute. You keep coming up with the cutest things!! Here from the weekend showcase and in awe of your handiwork. Hi! This is my first visit to your blog via Beverly's "Pink Saturday" party. I SO admire people with the creative gene that engineers the power to knit and/or crochet and/or sew!!! Those talents are totally elusive to me! I know your guests were thrilled to get these hand and heart-made favors that they can continue to enjoy long after the kisses are devoured! Have a Happy Valentine's Day! These are so cute. I especially love the little red flower! Thanks for sharing with SYC. These are fabulous...I think a bigger version would also be adorable...thanks for sharing andhappy pink saturday...your newest follower. Wow, fabulous! I so love the idea and the flowers you used. Super super cute! I wish I crocheted! I would love to make something like this! Very cute! thanks for sharing your baskets at Bacon Time! Have a happy V day. You are so talented!! Thanks so much for stopping by and sharing your great baskets!!! Hope you'll stop by often!! I am featuring you today on my 'showing a little love' challenge today. Your baskets are so cute!!! Wish I know how to do this. So beautiful! These are so cute and I love the red flowers on them. Thanks for sharing at TTF! Adorable. Thank you so much for linking these up at the FineCraftGuild.com linky party. I think these baskets are fun for many other ocassions as well. It's fun having you join our party each week. See you soon again!